This month, order by April 30! 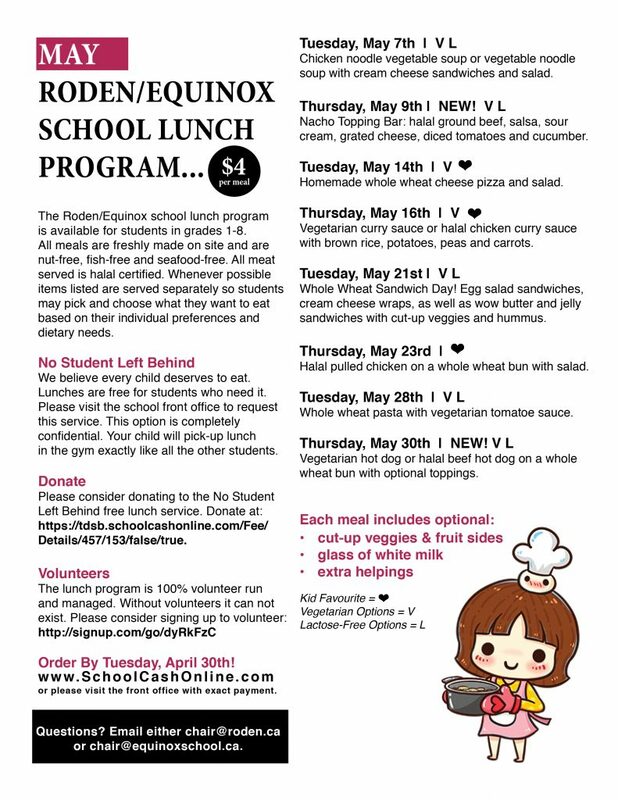 Roden and Equinox are pleased to launch a brand NEW healthy lunch program for grades 1-8. All meals are made right here on-site in our shared school kitchen by Susanna and Heather who run our school’s amazing Breakfast Club and snack program. They will be assisted by student volunteers in grades 5 and up. All meals are nut-free, fish-free and seafood-free due to severe allergies within our schools. All meat served is halal certified. The lunch process will be the same as Pizza Days. Students who ordered will receive a lunch ticket from their teacher and they can exchange it for lunch in the gym. Order Your Child’s Meals Today! Visit www.SchoolCashOnline.com or the school front office with exact payment.